Intermediate filaments (IFs) are one of three filament systems comprising the cytoskeleton of metazoan cells. IFs are highly dynamic structures essential for organizing the actin and tubulin filament systems and regulating cell signaling, motility, structure, and adhesion during interphase and mitosis. The function and localization of IFs are regulated by post-translational modifications (PTMs) such as phosphorylation, SUMOylation, ADP ribosylation, and O-GlcNAcylation1-4. The most common IF is vimentin. Vimentin is a type III IF protein found in cultured and tumor cells as wellas the majority of cells derived from the mesenchyme and vimentin filaments are considered a marker of the epithelial to mesenchymal transition5,6. 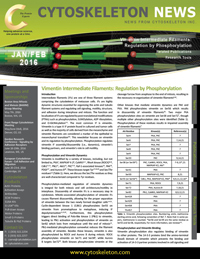 This newsletter focuses on vimentin and its regulation by phosphorylation. Phosphorylation regulates vimentin IF assembly/disassembly (i.e., dynamics), vimentin's binding partners, and vimentin's role in cell motility. Vimentin is modified by a variety of kinases, including, but not limited to, PKA7, MAPKAP K-28, CaMKII1-4 , RhoA kinase (ROCK)9,10, Cdk111,12, Plk112, Akt113, PKC7,14, Raf-1-associated kinases15, PAK16, PDGF17, and Aurora B18. These kinases target Tyr17,19,20 and Ser/Thr residues2,3 (Table 1). Here, we discuss the Ser/Thr residues as they are well-characterized compared to Tyr residues. Phosphorylation-mediated regulation of vimentin dynamics is integral for both mitosis and cell architecture/motility in interphase. Disassembly of vimentin IFs is a necessary step in cytokinesis. Mitotic-associated phosphorylation of vimentin IFs causes filament disassembly, allowing for the proper separation of vimentin between the two newly formed daughter cells1-4,21. Cyclin-dependent kinase 1 (Cdk1) phosphorylates Ser55 on vimentin from prometaphase to metaphase, inducing IF depolymerization11,12,22. Furthermore, this phosphorylation triggers direct binding of Polo-like kinase 1 (Plk1) to vimentin, leading to Plk1 activation and phosphorylation of vimentin on Ser82 which lasts from metaphase until the end of mitosis12. Plk1-mediated phosphorylation somewhat reduces the filament assembly of vimentin. Besides these kinases, vimentin is also phosphorylated by ROCK and Aurora B during mitosis. ROCK phosphorylates vimentin on Ser71 and Ser389, while Aurora B targets Ser7218. Both kinases phosphorylate vimentin at the cleavage furrow from anaphase to the end of mitosis, resulting in the necessary re-organization of vimentin filaments9,18. Other kinases that mediate vimentin dynamics are PAK and PKA. PAK phosphorylates vimentin on Ser56 which results in disassembly of vimentin filaments16. Two major PKA phosphorylation sites on vimentin are Ser38 and Ser727, though multiple other phosphorylation sites were identified (Table 1). Phosphorylation of these residues results in impaired assembly of vimentin filaments7. Table 1. Vimentin phosphorylation sites. Numbering omits methionine starting amino acid, following convention of Ref. 7. Note that in some papers, methionone is counted. *Ser56 and Ser39 are the same residue as Ser55 and Ser38, respectively. For more information, see reviews1-4. Vimentin phosphorylation also regulates binding of vimentin to other proteins. The 14-3-3 proteins bind the amino-terminal (head) domain of vimentin which prevents the binding and activation of 14-3-3 partner proteins involved in cell signaling and cell cycle control, including oncogenic Raf23. Binding of 14-3-3 to vimentin requires phosphorylation of Ser/Thr residues on the amino-terminus of vimentin. Similarly, binding between Akt-phosphorylated Beclin 1 and vimentin is dependent upon phosphorylation of Ser39 on vimentin24. The Beclin 1/vimentin complex is involved in the inhibition of autophagy and Akt-mediated transformation24. Vimentin phosphorylation also regulates processes underlying cell motility in normal and cancer cells. PKC mediates phosphorylation of vimentin (Ser6 and Ser33) that is associated with integrin-containing vesicles14. Integrins are needed for proper cell adhesion and motility and correct localization depends upon PKC-mediated phosphorylation of vimentin which allows proper integrin trafficking through vesicles to the plasma membrane14. Correspondingly, cell migration increases with PKC-mediated phosphorylation of vimentin. Vimentin phosphorylation is also integral in cellular responses to growth factors and Rho family GTPase activation. In serum-starved or non-motile fibroblasts, vimentin IFs are found throughout the cell periphery. Exposure to serum or photoactivatable Rac1 GTPase induces vimentin phosphorylation, IF depolymerization, and IF retraction from the cell periphery25. Vimentin phosphorylation also regulates cell motility in cancer cells. Upon activation of Akt, its tail region binds to vimentin's head region, resulting in phosphorylation of Ser39 on vimentin and a corresponding increase in cancer cell motility and invasion in vitro and tumor and metastasis growth in vivo. Increased motility is likely due to phosphorylation-induced disassembly of vimentin IFs. Furthermore, Akt1 phosphorylation of vimentin also offers a level of protection against caspase-mediate proteolysis13. Phosphorylation of vimentin does not always affect vimentin dynamics. Mitogen-activated protein kinase-activated protein kinase-2 (MAPKAP-K2) phosphorylates Ser38, Ser50, Ser55, and Ser828, none of which alters vimentin filament assembly8, prompting the suggestion that vimentin can function as a phosphate sink8,26. Vimentin IFs are modified by phosphorylation and at least three other PTMs (ADP ribosylation27, SUMOylation28, and O-GlcNAcylation29,30). Through these modifications, vimentin is spatially and functionally regulated. Despite a recent focus on the under-appreciated role vimentin IFs have in a myriad of cellular processes, much remains to be discovered, including the potential of PTM cross-talk30. Lowery J. et al. 2015. Intermediate filaments play a pivotal role in regulating cell architecture and function. J. Biol. Chem. 290, 17145-17153. Gruenbaum Y. and Aebi U. 2014. Intermediate filaments: a dynamic network that controls cell mechanics. F1000Prime Rep. 6, 54. Snider N.T. and Omary M.B. 2014. Post-translational modifications of intermediate filament proteins: mechanisms and functions. Nat. Rev. Mol. Cell Biol. 15, 163-177. Hyder C.L. et al. 2008. Providing cellular signposts – Post-translational modifications of intermediate filaments. FEBS Lett. 582, 2140-2148. Hay E.D. 2005. The mesenchymal cell, its role in the embryo, and the remarkable signaling mechanisms that create it. Dev. Dyn. 233, 706-720. Mendez M.G. et al. 2010. Vimentin induces changes in cell shape, motility, and adhesion during the epithelial to mesenchymal transition. FASEB J. 24, 1838-1851. Eriksson J.E. et al. 2004. Specific in vivo phosphorylation sites determine the assembly dynamics of vimentin imtermediate filaments. J. Cell Sci. 117, 919-932. Cheng T.J. et al. 2003. Retaining of the assembly capability of vimentin phosphorylated by mitogen-activated protein kinase-activated protein kinase-2. J. Cell Biochem. 89, 589-602. Goto H. et al. 1998. Phosphorylation of vimentin by Rho-associated kinase at a unique amino-terminal site that is specifically phosphorylated during cytokinesis. J. Biol. Chem. 273, 11728-11736. Sin W.-C. et al. 1998. RhoA-binding kinase a translocation is facilitated by the collapse of the vimentin intermediate filament network. Mol. Cell. Biol. 18, 6325-6339. Tsujimura K. et al. 1994. Visualization and function of vimentin phosphorylation by cdc2 kinase during mitosis. J. Biol. Chem. 269, 31097-31106. Yamaguchi T. et al. 2005. Phosphorylation by Cdk1 induces Plk1-mediated vimentin phosphorylation during mitosis. J. Cell Biol. 171, 431-436. Zhu Q.-S. et al. 2011. Vimentin is a novel AKT1 target mediating motility and invasion. Oncogene. 30, 457-470. Ivaska J. et al. 2005. PKCe-mediated phosphorylation of vimentin controls integrin recycling and motility. EMBO J. 24, 3834-3845. Janosch P. et al. 2000. The Raf-1 kinase associates with vimentin kinases and regulates the structure of vimentin filaments. FASEB J. 14, 2008-2021. Li Q.-F. et al. 2006. Critical role of vimentin phosphorylation at Ser-56 by p21-activated kinase in vimentin cytoskeleton signaling. J. Biol. Chem. 281, 34716-34724. Valgeirsdottir S. et al. 1998. PDGF induces reorganization of vimentin filaments. J. Cell Sci. 111, 1973-1980. Goto H. et al. 2003. Aurora-B regulates the cleavage furrow-specific vimentin phosphorylation in the cytokinetic process. J. Biol. Chem. 278, 8526-8530. Lim Y.P. et al. 2004. Selective tyrosine hyperphosphorylation of cytoskeletal and stress proteins in primary human breast cancers: implications for adjuvant use of kinase-inhibitory drugs. Clin. Cancer Res. 10, 3980-3987. Barberis L. et al. 2009. Leukocyte transmigration is modulated by chemokine-mediated PI3Kg-dependent phosphorylation of vimentin. Eur. J. Immunol. 39, 1136-1146. Yasui Y. et al. 2001. Protein kinases required for segregation of vimentin filaments in mitotic process. Oncogene. 20, 2868-2876. Chou Y.H. et al. 1990. Intermediate filament reorganization during mitosis is mediated by p34cdc2 phosphorylation of vimentin. Cell. 62, 1063-1071. Tzivion G. et al. 2000. Calyculin A-induced vimentin phosphorylation sequesters 14-3-3 and displaces other 14-3-3 partners in vivo. J. Biol. Chem. 275, 29772-29778. Wang R.C. et al. 2012. Akt-mediated regulation of autophagy and tumorigenesis through Beclin 1 phosphorylation. Science. 338, 956-959. Helfand B.T. et al. 2011. Vimentin organization modulates the formation of lamellipodia. Mol. Biol. Cell. 22, 1274-1289. Lai Y.K. et al. 1993. Vimentin serves as a phosphate sink during the apparent activation of protein kinaes by okadaic acid in mammalian cells. J. Cell Biochem. 53, 161-168. Icenogle L.M. et al. 2012. Molecular and biological characterization of streptococcal SpyA-mediated ADP-ribosylation of intermediate filament protein vimentin. J. Biol. Chem. 287, 21481-21491. Snider N.T. et al. 2011. Keratin hypersumoylation alters filament dynamics and is a marker for human liver disease and keratin mutation. J. Biol. Chem. 286, 2273-2284. Wang Z. et al. 2007. Dynamic interplay between O-linked N-Acetylglucosaminylation and glycogen synthase kinase-3-dependent phosphorylation. Mol. Cell. Proteomics. 6, 1365-1379. Slawson C. et al. 2008. A mitotic glcNAcylation/phosphorylation signaling complex alters the posttranslational state of the cytoskeletal protein vimentin. Mol. Biol. Cell. 19, 4130-4140.